Finally, you have a great night’s sleep and feel relaxed and rejuvenated. You start your morning routine, look in the mirror and notice that those annoying dark circles are still there. We know how frustrating this can be. But it’s important to remember that the skin around your eyes is very delicate. One night of restful sleep may not do the trick. So, we called upon the skincare experts at Murad® to learn more about dark circles and how to prevent them. The skin around the eyes is fragile, and readily shows the signs of age, fatigue and stress. The tissue is thinner, water evaporation is rapid and the collagen and elastin fibers are less numerous. In addition, the eye area has few (if any) oil-producing glands, so it requires intense hydration that my not be appropriate for the rest of your face. Although some dark circles are genetic, you can reduce their appearance by getting plenty of sleep and keeping your body hydrated by eating lots of raw fruits and vegetables on daily basis. You can also relieve tired eyes with products that contain wild yam and soybean to increase firmness, caffeine and light refractors to minimize puffiness and chamomile extract to calm and soothe. Most importantly, take time to relax! Sleep and relaxation are key to keeping your eyes looking refreshed and youthful. Try taking a hot bath before bed and make sure to shut off all distractions (television, Smartphone and computers) an hour before you turn in for the night. At all Massage Envy Spa clinics, we offer four different Murad® Healthy Skin facials, as well as an array of Murad® skincare products. 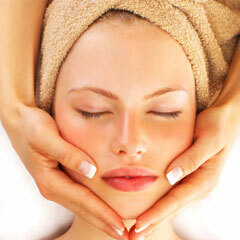 To determine what treatment is best for your skin, visit http://www.massageenvy.com/facials.